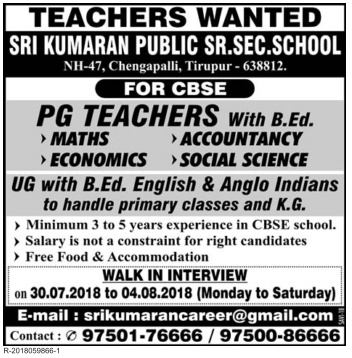 Sri Kumaran Public Senior Secondary School, Tirupur has advertised in the DINAMALAR newspaper for recruitment of Teachers PGT jobs vacancies. Interested and eligible job aspirants are requested to walk-in from 30th July 2018 to 04th August 2018. Check out further more details below. PG with B.Ed. Minimum 3 years experience is required.